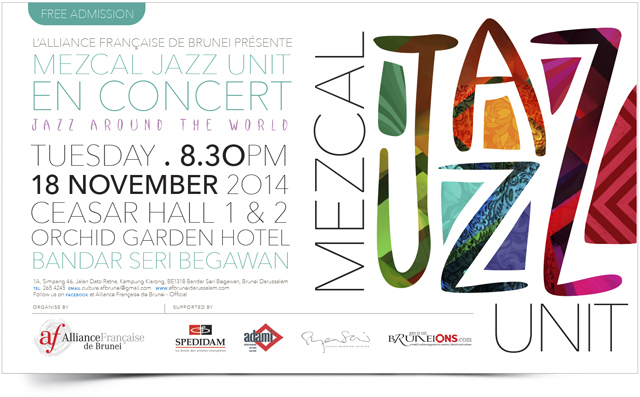 Alliance Française de Brunei will be organizing a Jazz Concert on Tuesday the 18th of November 2014. The performance will be held at Ceasar Hall, Orchid Garden Hotel, Bandar Seri Begawan, Brunei Darussalam. This musical event will be showcasing an instrumental jazz band from France, Mezcal Jazz Unit, where they will be playing their own creative creation with mixed influences in phase with the main actual french jazz streams. Some particularities of the music played by Mezcal Jazz Unit are given by the Mediterranean feeling of the musicians, the reminiscences of traditional melodies, a real attraction for oriental music, a rocky energy, a sense of humor, and a mix between emotional introspection and a very specifically Latin expressive attitude. 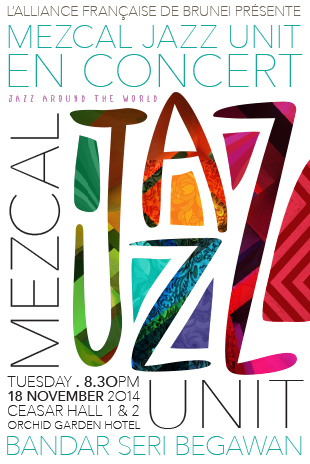 Mezcal Jazz Unit is a "live" band. Its music is based on pleasure and communion between musicians. The ability to communicate with the public is for this band a priority: as important than technical and musical performances. The band Mezcal Jazz Unit, leaded by Emmanuel De Gouvello (bass, composition) lives near Montpellier-South of France, since 1986. The other members of this band are: Christophe Azema, Daniel Solia & jean Marie Frédéric. This band performed for several tours in the following countries: France, Austria, Germany, Poland, Czech Republic, Slovaquia, Lithuania, Latvia, Estonia, Bielorussia, Russia, Azerbaidjan, Hungary, Roumania, Moldavia, Ukrania, Burkina Faso, Maroco, Nigeria, India, Vietnam, Laos, Cambodia, USA, Guatemala, Honduras, Nicaragua, El Salvador. The event admission is free and is open to the public, for further information of the event please contact Alliance Francaise de Brunei at 265 4245. Click here to sample and listen to their music online and to find out more about the band. Press release provided by Alliance Francaise de Brunei.